Orkin Commercial Services (http://www.orkincommercial.com) has partnered with NSF International (http://www.nsf.org) to provide free educational resources to the food processing industry. Each online tool equips business owners and operators in the fight against pests, while preparing them for audits. A leading independent provider of food safety services, NSF International collaborated with Orkin on two Orkin University tools for food processors  bringing a valuable auditors perspective. The educational tools can be downloaded at www.orkincommercial.com under the About Orkin menu. 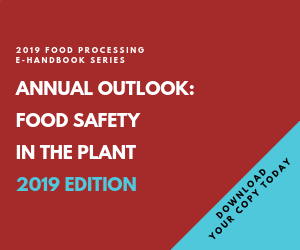 Pre-Audit Checklist provides a step-by-step checklist and pest control recommendations for food processing, manufacturing, and storage facilities preparing for third-party food safety audits. Sanitation and Storage Quiz is a tool to see how facilities rank in best practices for sanitation and storage. Its a short 15-question quiz that can help managers improve sanitation measures. NSF International is an independent organization that certifies products and writes standards for food, water and consumer goods. In addition to partnering on training materials, Orkin and NSF Cook & Thurber  a division of NSF International  co-sponsor the Gold Medal IPM Partner Awards to honor food processors and packaging facilities that excel at Integrated Pest Management (IPM). Environmentally friendly IPM programs manage pests effectively, protect food safety and support better audit performance. Orkin University also provides training videos on 5 Steps to a Better Audit and ABCs of Pest Habitat Modification. For the past six years, Orkin has been named one of Training magazines Top 125 firms that excel in human capital development.